Base & Bling Jewelry - Only your imagination limits how it looks! Welcome to the October Blog Hop featuring the new Base & Bling collection! You will see contributions from our participants that will include necklaces, rings, bracelets, hair bands and so much more. To purchase any of the items seen in our blog hop today, contact your local consultant to place an order. If you have just hopped onto my blog, you can start here as this is a circular hop, but if you want to follow us across Canada then please start at the beginning and join Michelle in Nova Scotia at http://mycreationswithmichelle.blogspot.ca. If you came from Brandy's Blog then you are in the right place! I am not much of a jewellery hound (I have a ton of necklaces and bracelets and never wear them) so decided to see what I could do with the hair clips. There are so many ideas in the Autumn/Winter 2013 Idea Book! 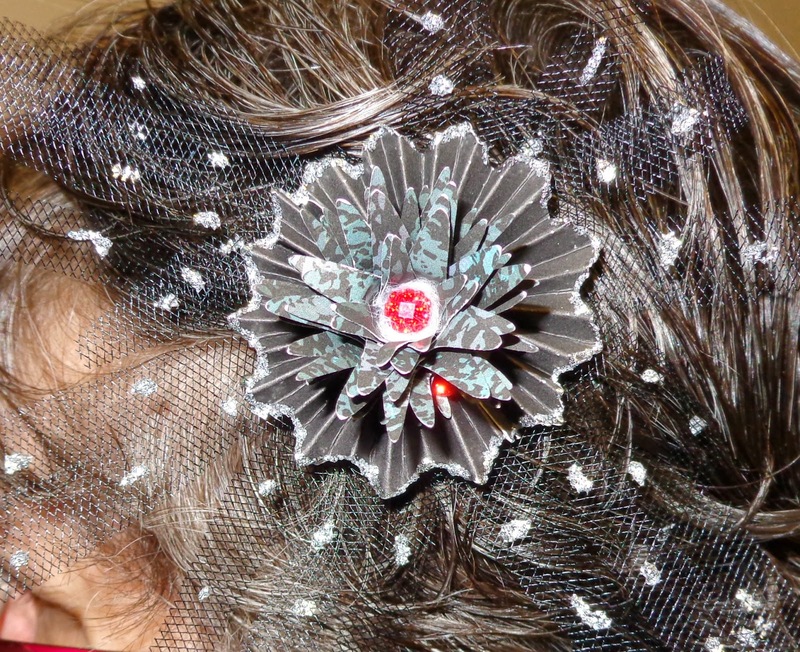 Since it is October and we will soon be celebrating Halloween, I decided to make a Halloween hair clip (I was going to make two, but will keep one to make a Christmas clip). It is supposed to look like a black, hairy, gross spider. What do you think? First I placed an adhesive disk in the center of the hair clip and removed the backing. 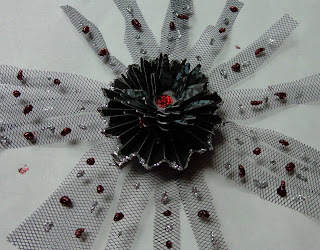 Then I stuck our black tulle to the very edge, making small pleats as I went around. This made the tulle form a sort of tube with the clip at the bottom. I then cut the tulle into even strips all the way around so it lay flat. The medallion was cut with the Artist cartridge at 1" and the spiky flower was cut at 5" using the Art Philosophy cartridge. The white halo around the gem in the center is actually a tiny piece of cotton ball. I wanted it to look like something the spider may have caught and I think does it well! 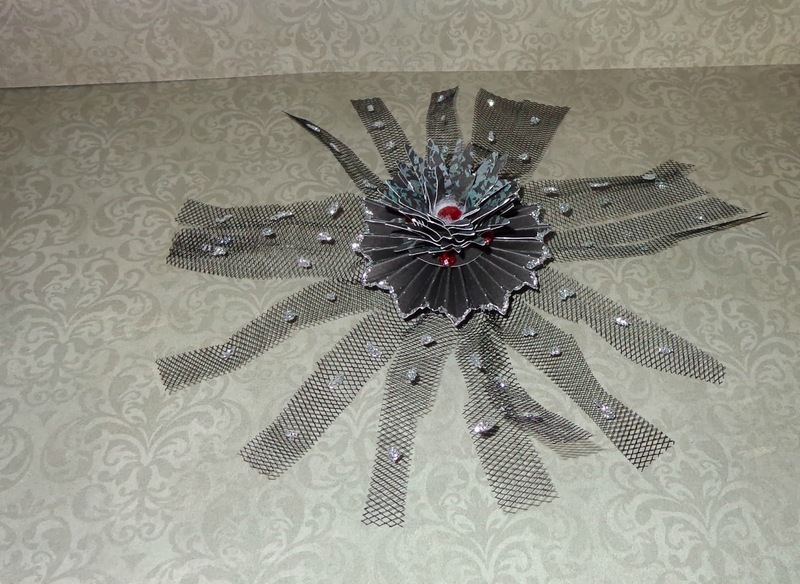 Last, I used the silver glitter get to go around the edge of the medallion and then dropped blobs on the tulle "legs". (I know there are a lot more legs than on a real spider, but if you feel the same way about spiders that I do, they LOOK like they have this many legs! YEESH!!). Of course, the glitter gel goes right through the tulle, so make sure to put it on a piece of paper and when it is dry, lift if off carefully. I had to carefully pry a few of them off the paper because the gel stuck like, well, glue! I decided to add some red Glitz Glitter Gel to the tulle and I think I like it a lot better! Your next stop on the Cross Canada Hop is Nancy Klein in Southern Alberta! If you get lost along the way, you can head back to Nova Scotia and Michelle's blog, http://mycreationswithmichelle.blogspot.ca, as she has the complete blog list. Thanks for hopping along with us - we hope we were able to inspire you to get creative using some of the designs, products and techniques seen along the way. Join us again in November when we will be featuring the projects from the new Mini Holiday Gift Guide. We hope you will join us again on Novmeber 15th. If you are interested in purchasing any of the products used in the any of the projects, please consult you local Close to my Heart consultant!